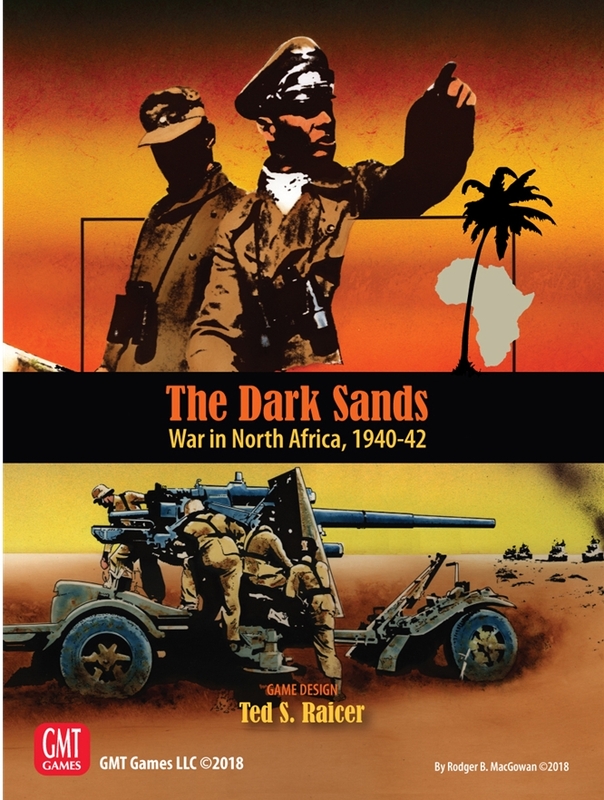 The Dark Sands takes the game system from Ted S. Raicer�s sold-out and critically acclaimed The Dark Valley: The East Front Campaign to the legendary battles of North Africa in WWII. From the most successful British armored operation of the war, Operation Compass, to the climactic battle two years later at El Alamein, The Dark Sands breaks new ground in portraying the campaigns of the British 8th Army and Rommel�s Afrika Korps. The 264 5/8� counters portray the Axis and British Empire forces from battalions to divisions (most British units are brigades). Movement allowances range from 4 to 10, but all units can use Extended Movement. This allows unlimited movement along roads and trails provided you do not move adjacent to an enemy unit. But the risk of breakdown and attrition means it must be used sparingly, while allowing for the historical retreats and pursuits that moved halfway across the map in a couple of weeks. The random Action Chit system from The Dark Valley allows for fog of war without hidden units or simultaneous movement. Chits activate either one�s entire force or portions thereof, for movement, combat, and sometimes both together. But unlike The Dark Valley, there are limits on the number of chits one side may play in a row as the smaller armies and more limited battlefields of North Africa meant the armies were better able to quickly react to one another�s actions. But as with The Dark Valley, chit draws will shape rather than decide the course of the game, and the player who can best adapt to uncertainty will come out on top. Reinforcements arrive on a historical schedule, modified by the fact that each sides reinforcements are placed on the map when their Reinforcement Action Chit is picked. So you know that division you need will arrive next turn, but you don�t know WHEN during that turn. The British also have to deal with units being withdrawn to other fronts. Replacements are handled by another set of chits, which varies the number of replacement points available to rebuild your forces. But only the British may save replacements, and the British also upgrade their tank forces during the war. The Desert War has been described as �a tactician�s paradise and a quartermaster�s hell.� The Dark Sands allows you to concentrate on the former, while allowing the game system to handle the latter. An excellent solo game, it is also a sharp contest of wits between opposing players. With a campaign game playable in a day and scenarios playable in a couple of hours, The Dark Sands will provide a fresh challenge to even the most experienced armchair Monty or Rommel.